As advisors, counselors, and financial aid staff, we want our students to plan for the costs of college and to understand how certain financial decisions they make today can have a major impact on their future financial wellness. But where do we start the conversation, and how? 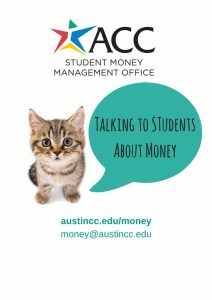 Join the Student Money Management Office to learn how to integrate financial conversations into the one-on-one work we do with students. Expect to learn and talk about topics like budgeting, credit, and student loan debt.